We’d love your help. Let us know what’s wrong with this preview of Elements of Programming Interviews by Adnan Aziz. This is a larger-format version of Elements of Programming Interviews. The language is C]+. Specifically, the font size is larger, and the page size is 7"x10" (the regular format uses 6"x9"). Wished you could This is a larger-format version of Elements of Programming Interviews. The language is C]+. Specifically, the font size is larger, and the page size is 7"x10" (the regular format uses 6"x9"). EPI is your comprehensive guide to interviewing for software development roles. The core of EPI is a collection of over 250 problems with detailed solutions. The problems are representative of interview questions asked at leading software companies. The problems are illustrated with 200 figures, 300 tested programs, and 150 additional variants. The book begins with a summary of the nontechnical aspects of interviewing, such as strategies for a great interview, common mistakes, perspectives from the other side of the table, tips on negotiating the best offer, and a guide to the best ways to use EPI. We also provide a summary of data structures, algorithms, and problem solving patterns. Coding problems are presented through a series of chapters on basic and advanced data structures, searching, sorting, algorithm design principles, and concurrency. Each chapter stars with a brief introduction, a case study, top tips, and a review of the most important library methods. This is followed by a broad and thought-provoking set of problems. A practical, fun approach to computer science fundamentals, as seen through the lens of common programming interview questions. To ask other readers questions about Elements of Programming Interviews, please sign up. This should become the de facto book on interviews. It is loaded with great problems and puzzles. The solutions are very comprehensive. However, don't buy this book thinking that it will teach you about heaps or binary search trees. It merely contains a few paragraphs for each topic and then goes straight to the problems. You'll need another book to learn about the data structures and algorithms that go with them. I'd recommend CLRS (Intro to Algorithms) but many others will do (like Sedgewick or This should become the de facto book on interviews. It is loaded with great problems and puzzles. The solutions are very comprehensive. However, don't buy this book thinking that it will teach you about heaps or binary search trees. It merely contains a few paragraphs for each topic and then goes straight to the problems. You'll need another book to learn about the data structures and algorithms that go with them. I'd recommend CLRS (Intro to Algorithms) but many others will do (like Sedgewick or Skiena). This book also contains a few chapters devoted to the interview process itself. These chapters are just as golden as the technical ones. Interviewing is more about just solving the problems. They want to see who you are as well. Back to book, explanations were not that clear and most importantly the code was incredibly hard to read. I think there's a new Java version now, so I'd say just go read that one because seriously WTF/minute ratio is way too high for C++ version. It contains many good questions. There are though many questions that were silly or it didn't stress a concept that you need to learn. Yes, this book is full of interview questions. However, the criteria the authors used to pick the questions is quite academic and may not be very pragmatic. It is hard to believe that any of today's interviewers would ask some of the questions in the book within the average interview session time span of 45 minutes. IMHO, more than 50% of the problems in the book fall into this category. Furthermore, it lacks of short reviews in the chapters. Some short summary of the topics in discussion would b Yes, this book is full of interview questions. However, the criteria the authors used to pick the questions is quite academic and may not be very pragmatic. It is hard to believe that any of today's interviewers would ask some of the questions in the book within the average interview session time span of 45 minutes. IMHO, more than 50% of the problems in the book fall into this category. Furthermore, it lacks of short reviews in the chapters. Some short summary of the topics in discussion would be much more useful for the readers. Readers may find it difficult to jump right into the problems/solutions so quickly. Also, the solutions are often too succinct. It would be more useful to give some guidance on the concepts/approaches than giving solutions directly. While "Cracking The Coding Interview" from CareerCup.com has been overdoing it, this book is in want of better hints/guides to help the readers to form their thought process. Of, there are also errors and ambiguity in some of the questions. I am not a fan of textbook style representation. Thick textbooks require skimming skill which I personally find painful when reading technical materials - I either skip some important details, or stay on some trivial matter too long. EPI keeps it lean and clean, the book is by no mean for beginners but if you need a comprehensive yet succinct book to revise and enhance your Algorithm knowledge, this is what to get. Everything is to the point and sometimes too briefly explained that it takes a whi I am not a fan of textbook style representation. Thick textbooks require skimming skill which I personally find painful when reading technical materials - I either skip some important details, or stay on some trivial matter too long. EPI keeps it lean and clean, the book is by no mean for beginners but if you need a comprehensive yet succinct book to revise and enhance your Algorithm knowledge, this is what to get. Everything is to the point and sometimes too briefly explained that it takes a while to figure out, but that's a very enjoying process on its own. 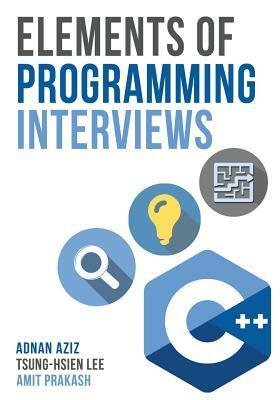 A coding interview prep book in C++. This is actually a good book and I found it to have a much better content than another popular book "Cracking the Coding Interview" by Gayle. Must read for interview preparation. As good as "Cracking the coding interview", if not better. Solutions in C++. Twice as many problems and solutions than CCI. However, unlike CCI, it doesn't have enough review before each topic. You need to check out another source (there are plenty) for that. I would love to see a similar book for Python. This book contains a really good collection of interview questions. It's pretty comprehensive in its coverage. However the explanations were a bit terse at places, they could use more pictorial explanations.